Royal Purple supplies high-performance lubricants, oils and greases for industrial applications such as power generation. Combining premium base oils with proprietary additive technologies, the company develops a series of specialised lubrication products that outperform conventional mineral-based and synthetic oils for areas that include adverse environments. 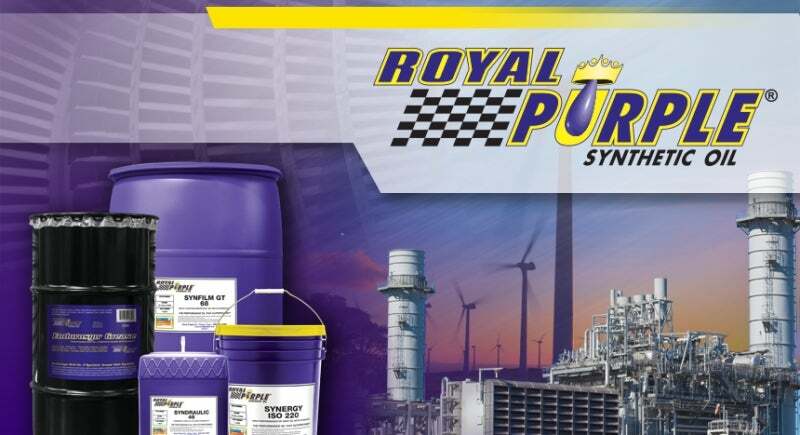 Royal Purple’s Synfilm GT Wind Gear 320 is a multipurpose, energy-efficient, synthetic gear oil formulated for bearings, blowers, fans, gas and steam turbines, pumps, gears and gear boxes, and air compressors and tools. The Synfilm GT Wind Gear 320 extends equipment reliability, while offering high-wear protection and improved turbine-efficiency. Royal Purple’s ultra performance grease is a multipurpose, synthetic, aluminum complex product is designed to treat bearings and other general purpose use. It is highly resistant to water and oxidation, and optimises the operational performance of bearings. Royal Purple’s syndraulic lubricant increases the service life of oil, as well as a hydraulic system’s seals, pumps and filters. It also restores normal operation to problematic systems and reduces operating temperatures. Royal Purple offers a range of engine oils for industrial applications. The Aegis synthetic ashless 2-cycle natural gas engine oil is designed to offset fuel and operating costs. Royal Purple Motor Oil CJ-4 / CI-4+ high-performance oils are recommended for gasoline and diesel-operated commercial fleets and stationary industrial engines. It conserves fuels, raises horsepower and torque, as well as decreasing heat, emissions and wear. It has high-oxidation stability, meaning fewer oil changes are required, making it a more efficient, environmentally friendly oil. The Quadrex low-ash, four-cycle natural gas engine oil is designed to conserve fuel and decrease maintenance costs. Royal Purple’s range of specially designed gear oils enhance component performance. The company’s Synergy EP gear oil is intended for industrial gears composed of ferrous and non-ferrous metals in virtually all conditions. The Endurosyn high-performance grease is made of a calcium sulfonate complex, making it suitable for a wide range of multipurpose greasing applications. It also provides high-level protection against corrosion and water washout. Royal Purple has a series of industrial treatments for a wide range of components, such as chains, mechanical seals and open gears. The Barrier Fluid GT treats tandem and double mechanical seals, while MaxChain is suitable for chains and open gears in adverse environments. The company also provides MaxFilm, which is suitable for lubricating, preserving and protecting mechanical equipment and fastenings. For enhanced corrosion-resistance, Royal Purple also offers the VP-10 preservative / storage lubricant as well as clean and flush lubricants. The VP-10 protects engines, gearboxes, pumps and other closed systems from rust and corrosion. The Royal Purple clean and flush oil circulation system cleaner removes sludge and varnish from operational equipment. Lubricant performance can vary greatly between competing mineral and competing synthetic oils. A short video showing the uses of Bel Ray lubricants.